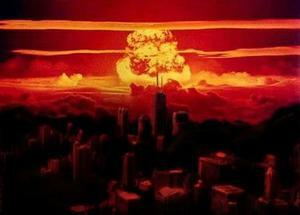 During the cold war, scientists modeled every imaginable consequence of a nuclear explosion. Michael Dillon, a Lawrence Livermore Lab mathematician, found a gap in the sheltering strategies for people far enough from ground zero to survive the initial blast but close enough to face deadly radioactive fallout. Dillon’s model’s addresses the most vulnerable people, those who found shelter from the blast in lightweight buildings, or buildings lacking a basement (these buildings are more easily penetrated by deadly radioactive dust). His recommendations: if adequate shelter is fifteen minutes away, people should remain in their initial, poor-quality shelter no longer than thirty minutes after detonation. If the better shelter is only five minutes away, however, individuals should move there immediately, leaving the closer but unsafe buildings altogether. Michael Dillon of the Lawrence Livermore National Laboratory in California has devised a mathematical model for limiting death and injury from radioactive fallout following a nuclear attack on a U.S. city. His model describes an “optimal shelter exit time” to lessen radiation damage. It is widely accepted that taking cover in existing buildings is a critical first action after a nuclear detonation in a major city. Science reports that how long people should stay inside buildings before moving to better shelter is a complex question. Lightweight buildings, and buildings which lack a basement, are more readily penetrated by deadly radioactive dust. Dillon, writing in the British scientific journal Proceedings of the Royal Society A, calculates that if adequate shelter is fifteen minutes away, people should remain in their initial, poor-quality shelter no longer than thirty minutes after detonation. If the better shelter is only five minutes away, however, individuals should move there immediately, leaving the closer but unsafe buildings altogether, he writes. Science notes that during the cold war, scientists modeled every imaginable consequence of a nuclear explosion. Dillon, however, found a gap in the sheltering strategies for people far enough from ground zero to survive the initial blast but close enough to face deadly radioactive fallout. He notes that he focused on a single low-yield nuclear detonation like those which destroyed Hiroshima and Nagasaki, but that today’s nuclear arsenals have grown far more powerful. Still, security experts say that low-yield bombs are the kind most likely to be used by terrorists. For Dillon, the hard part was determining what variables matter in surviving radioactive fallout. The rest was calculus. The longer you stay outside, the higher your radiation dose, but then, the intensity of environmental radiation also decreases over time. Your total radiation dose is thus a function of when you step outside, your distance from the detonation, how long you run before you reach better shelter, and how much shielding you get from the local environment while you are out there. Dillon simplified the calculation by assuming that you are totally exposed while running to safer shelter; he also ignored complexities such as limited shelter capacities. In the end, he says, the math boiled down to a single critical number: the ratio of the time you spend hunkering down in your first shelter to the time you spend moving to the high-quality shelter. Then Dillon worked out what would happen with a variety of shelter options and transit times. Dillon writes that if people could reach adequate shelter rapidly, this could save between 10,000 and 100,000 individuals from fatal exposure in the event of a single, low-yield detonation. “These methods are intended to assist emergency planning officials in the development of an optimal low-yield nuclear detonation response strategy,” wrote Dillon. A low-yield blast is described as 0.1-10 kilotons. One kiloton (kT) is an explosive force equivalent to that of 1,000 metric tons of TNT. The U.S. bomb that killed more than 200,000 people in Hiroshima, Japan, in 1945 was about 15 kT. Dillon notes that more than a fifth of American households lack basements or are considered too lightweight to offer shelter in the fallout phase of the emergency. Not everyone agrees with Dillon. “I disagree with the conclusions,” Lawrence Wein, an operations research scientist at Stanford University in Palo Alto, California, told Science. “He fails to account for several important issues that are vitally important for policy recommendations.” Anyone heading out into the apocalyptic wasteland will have no idea how long the transit time will really be. Because of this uncertainty, he says, the official U.S. government recommendation is “to shelter for at least twelve hours” after the blast.